We had 16 different costumes made for a costume change routine! All of the costumes are gimmicked so that you can change quickly! Here is the list of different costumes: - tuxedos - waiter - Musician - General (army) - Jokers - Dress - Skirts. 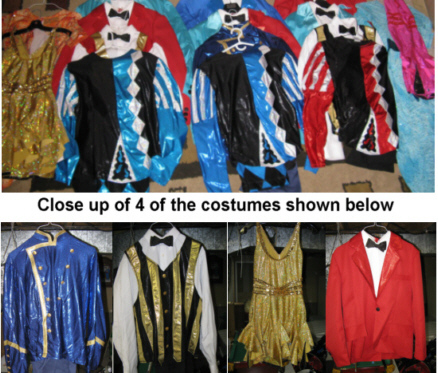 We are selling all 16 quick change costumes. All costumes are in perfect conditions and have nothing wrong with them. We used them in 8 shows only. They come in nice cloth carrying bags.